April arrivals: March's gusting winds brought boxoffice hits like "Cinderella" and "Insurgent"and Hollywood hopes to see that momentum continue in April. DreamWorks Animation and 20th Century Fox's opening of the 3D PG rated animated fantasy adventure "Home" ended March on a happy note with $54 million. And Warner Bros.' launch of the R rated comedy "Get Hard"opened solidly with $34.6 million. Both films will help drive ticket sales in the coming weeks. Meanwhile, April's first wide arrivalis a safe bet to get the month off to its own fast track start. Universal's PG-13 rated action crime thriller "Furious 7," opening Friday at about 3,700 theatres, faces no competition from other new wide releases. It's already tracking in turbo-charged double digits as an overall first choice. It's tracking best and way through the roof with under-25 males and is scoring next best with men over 25. While its scores are lower with women, they're also in solid double digits and nearly equal for those under and over 25. In movie marketing terms, "Furious 7" looks like a four-quadrant appeal film, which typically translates into muscular ticket sales. In "Furious 7," from "The Conjuring" and "Insidious" director James Wan, Deckard Shaw(Jason Statham) seeks revenge for his brother's death against Dominic Toretto (Vin Diesel) and his family. The film, which marks Paul Walker's final onscreen appearance, also stars Dwayne Johnson, Tyrese Gibson, Michelle Rodriguez and Jordana Brewster. "Furious 7" was originally scheduled to open last July 11, but after Walker's tragic car crash death in November 2013, production was shut down and the picture's release was delayed. The previous six episodes in "The Fast and the Furious" franchise, which began in June 2001, grossed $937.8 million in domestic theatres. The last episode, "Fast & Furious 6," opened May 24, 2013 to $97.4 million and went on to do $238.7 million domestically. Universal's decision to launch "Furious 7" the first week in April rather than in late May (like the last one) just as summer gets underway, reflects Hollywood's growing view that movies area year-round business. Studios are now inclined to make the most of what once were considered to be quieter times of the year. They've seen that films can make a big boxoffice impact on such weekends without facing the intense competition from the logjam of openings that the summer brings. 20th Century Fox and Fox 2000 Pictures' PG-13 rated romantic drama "The Longest Ride" hits multiplexes Apr. 10. Directed by George Tillman Jr. ("The Inevitable Defeat of Mister & Pete"), it stars Scott Eastwood, Britt Robertson and Melissa Benoist. "Ride" is tracking best with women under 25 and next best with over-25 women. So it's perfectfemale appeal counter-programming towhat should be a strong second weekend for the heavily male appeal "Furious 7." Based on the bestselling novel by Nicholas Sparks ("The Notebook"), "Ride" focuses on the star-crossed love affair between Luke (Eastwood), a former champion bull rider hoping for a comeback, and Sophia (Robertson), a college student about to start her dream job in New York's art world. Sophia and Luke make an unexpected and fateful connection with Ira (Alan Alda), whose memories of his own decades-long romance with his wife inspire the young couple. "Ride," whose intertwining love stories span generations, explores the challenges and great rewards of enduring love. "Ride" isn't running into any other wide openings because Paramount decided in lateMarch to pull its planned release of the period piece action adventure fantasy "The Moon and the Sun,"starring Pierce Brosnan. In "Moon," France's King Louis XIV (Brosnan) seeks immortality by taking a mermaid's life force. No new release plans for the film have been announced yet. April's third weekend will be much more crowded, with four wide openings competing for moviegoers' time and money. Columbia Pictures and Happy Madison Productions' PG rated action comedy "Paul Blart: Mall Cop 2" is from "Parental Guidance" director Andy Fickman and stars Kevin James, Raini Rodriguez and Eduardo Verastegui. It's tracking best and equally well with men under and over 25 and nearly as well with 25-plus women. In the franchise's new episode,Paul Blart (James) is heading to Las Vegas for a Security Guard Expo. While there, Blart inadvertently discovers a heist, after which it's up to him to apprehend the criminals. Also arriving Apr. 17 is Universal's R rated horror thriller "Unfriended." Directed by Levan Gabriadze ("Lucky Trouble"), it stars Cal Barnes, Matthew Bohrer and Courtney Halverson.It's tracking best and equally well with under-25 men and women. In "Unfriended,"six high school friends are video chatting one night when they receive a message from a classmate who killed herself a year earlier. At first they think it's a prank, but when she starts revealing their darkest secrets, they realize they're dealing with something from out of this world that wants them dead. 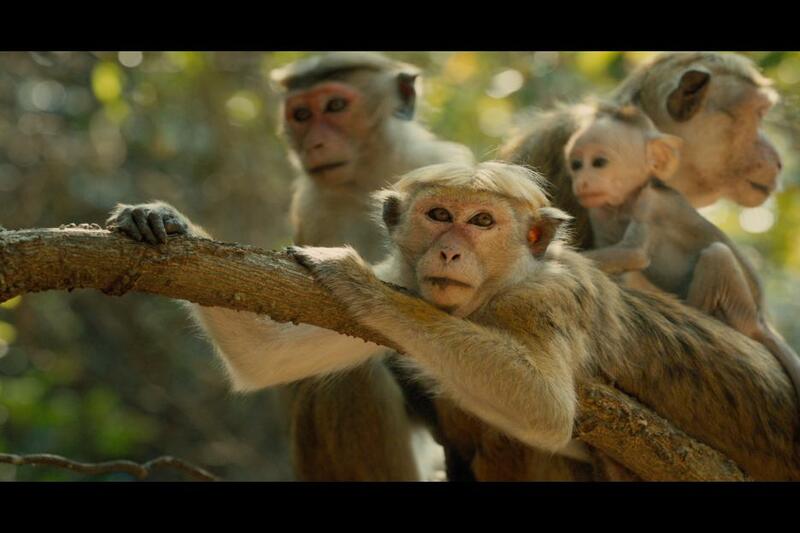 Disneynature's G rated documentary "Monkey Kingdom" is also on deck for Apr. 17. Directed by Mark Linfield ("Chimpanzee") & Alastair Fothergill ("Bears"), it's narrated by Tina Fey. "Monkey" is tracking best and equally well with men and women over 25, a good sign that it should attract family audiences. The nature documentary follows a newborn monkey and its mother struggling to survive within the competitive social hierarchy of the Temple Troop, a dynamic group of monkeys living in ancient ruins found deep in the jungles of South Asia. This is the eighth in Disneynature’s True Life Adventure series. It's the follow-up to the "Bears," which opened Apr. 18, 2014 to $4.8 million and went on to gross $17.8 million domestically. Rounding out Apr. 17's new wide releases is Lionsgate and Summit Entertainment's R rated thriller "Child 44," directed by Daniel Espinosa ("Safe House") and starring Tom Hardy, Joel Kinnaman and Gary Oldman.It should play best to adult males. Based on the first book in a trilogy by Tom Rob Smith, "Child" is set in 1953 Soviet Russia. It's story is about the crisis of conscience for secret police agent Leo Demidov (Hardy), who loses status, power and home after refusing to denounce his wife (Noomi Rapace) as a traitor. Exiled from Moscow to a grim provincial outpost, they join forces with General Mikhail Nesterov (Oldman) to track down a serial killer preying on young boys. Their quest for justice threatens a system-wide cover-up by Leo's psychopathic rival (Kinnaman). The month will wind up with the wide release Apr. 24 of the PG-13 rated romantic drama "The Age of Adaline" from Lionsgate, Sidney Kimmel Entertainment and Lakeshore Entertainment. Directed by Lee Toland Krieger ("Celeste & Jesse Forever"), "Adaline" stars Blake Lively, Michiel Huisman, Kathy Baker and Amanda Crew, with Harrison Ford, and Ellen Burstyn. It should play best to women over and under 25. In "Adaline," Adaline Bowman (Lively) has miraculously remained 29 years old for almost eight decades. She's lived a solitary existence, never allowing herself to get close to anyone who might reveal her secret. But a chance encounter with a charismatic philanthropist (Michiel Huisman) reignites her passion for life and romance. When a weekend with his parents (Harrison Ford and Kathy Baker) threatens to uncover the truth, Adaline makes a decision that will change her life forever. Bottom line: If you're wondering why "Adaline" is Apr. 24's only wide arrival, the likely answer can be found by looking one week into the future. May 1 is opening day for Marvel Studios and Disney's "Avengers: Age of Ultron," which many Hollywood handicappers expect to be this summer and, most likely, 2015's biggest grossing movie. Films opening Apr. 24 would see their second weekend wiped out by "Ultron's" first weekend, which should totally dominate the marketplace the way the franchise's first episode did. Understandably, no other wide openings will be going head-to-head with "Ultron" May 1. "The Avengers" opened May 4, 2012 to an overwhelming $200.4 million. It went on to gross $623.4 million domestically and took in $895.2 million more from international theatres for a global cume of $1.5 billion.